At first I was a bit reluctant to give this one an enthusiastic recommendation. It is a bit cheesy in some ways and peeking at other viewer’s ratings of this film, I seem to be way off target from mainstream horror fans. But the more I thought about it, the more it seemed that I had no choice. I think Amityville II is a much better film than its precursor, and I think it not only succeeds, but is ingeniously clever, on many different levels. On the other hand, I can see an argument that many of the things I’m about to praise about this film were at best accidental triumphs. 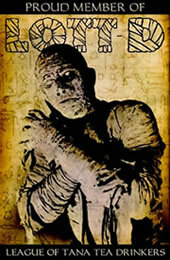 Still, I don’t think that really makes it less of a remarkable film. I’ll admit that Amityville II earns few points for originality. But this is a sequel, anyway. You don’t expect to see something unlike anything you’ve ever seen before. If we really made it a regular practice to deduct points for a lack of originality, many of us would have a hard time accounting for our profound love of films like Evil Dead II (1987). The Amityville II crew gives us the same basic structure as the first film. A relatively innocent family happens upon the now infamous home in Amityville, Long Island, which is for sale. It seems like a dream house. But it doesn’t take long after they begin moving in and getting settled for weird things to start happening, and gradually the family falls apart, various members seem to be either possessed or going insane (or both), the supernatural occurrences increase, a priest becomes involved and is negatively affected, etc. Although I think the first Amityville Horror film was wise to keep viewers’ interpretational options open as to whether supernatural activity was really occurring or whether George Lutz was simply going insane (at least for 2/3 of the film or so), Amityville II does make one significant break in that it’s pretty clear that supernatural stuff is happening right from the word "go." 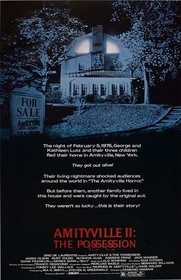 Amityville II is also odd in that it’s really a prequel. That’s unusual for a first chronological sequel. This film is very roughly based on the Ronald DeFeo case that preceded the Lutz’ purchase of the Amityville home, and unlike the tale of the first film, at least the rough facts here are true. It’s too bad this film didn’t come first and spawn a better Amityville Horror with James Brolin and Margot Kidder. It would have made more sense that way, as many of the things that happen in this film go a long way in justifying otherwise inexplicable occurrences in the other film. That it’s closer to reality, in conjunction with the clearer, earlier and more intense supernatural manifestations that director Damiano Damiani presents to us makes this infinitely creepier in my opinion. Damiani, in conjunction with the actors, does some incredible work here. For instance, the extended sequence which consists solely of long, close-focus tracking shots of Sonny Montelli (Jack Magner) moving backwards from an unseen supernatural force (he’s really reacting to nothing) is as good as any sequence in any horror film. I love camp, intentional or not, in horror, and probably because of that, I tend to look for it and find it easier than some folks, but despite this sequence being a bit over the top, I thought it came across as serious and powerful. Equally remarkable is that you could remove all of the horror material from Amityville II and still have a great film. Damiani and the scriptwriting team of Dardano Sacchetti and Tommy Lee Wallace, working from the book, "Murder in Amityville," by Hans Holzer, give us a fiercely powerful while also over-the-top portrayal of a dysfunctional family. The dad is a serious abuser. The mom is a serious apologizer and enabler. There are weird sexual tensions between the kids. The dad wants to turn the priest into an immoral party animal, etc. This is one twisted family, and everyone does a beautiful job in making them come to life on the screen. That this material is so potent only makes the effective horror stuff work that much better and come across as that more intense. I know I watched Amityville II close to the time when it was first released although I don’t remember it having such a strong impact on me back then. I can’t even remember if I saw it during its theatrical release or not. But whatever the present reason (who knows, maybe I was just in the perfect mood for it when I sat down to watch it on video and when I watch it again in the future I’ll think it is incredibly, unintentionally campy) it now strikes me as a perfect, quirky-if-almost-hammy haunted house/wacky family/serial killer film. On the other hand, I’ve really enjoyed even the most recent Amityville films that I’ve seen (what are we on now, number 34? ), so take that for what it’s worth to you. Although the film is set in 1974, one character can be seen listening to that great creation of the 80s, the Walkman.